The Canary All-in-One Home Security System and the Blink Home Security Camera System are marketed as easy to install do it yourself home security devices. Each offers motion detection, cloud storage and notification services. They both market home temperature monitoring. Let’s look at how these cameras compare. It’s the Canary versus Blink Home Security Camera System face-off. Let’s get on with our head to head analysis. Both application start up quickly on Apple iPhone 6s Plus. The Canary app shows the room temperature, humidity and air quality at startup. The Blink will show an old saved photo of the room. You click on the photo ro see live video. The Canary has a roughly 5-10 second delay in the video. So what you are looking at happened 5-10 seconds ago. The Blink has maybe a 1-2 second delay. If monitoring remotely, this probably doesn’t matter much but be aware of the slight delays. Neither the Canary nor the Blink Home Security Camera System have a useful browser app. In fact the Blink camera doesn’t have any whatsoever. Both companies have plans to provide one in the future. So for now, it’s all smartphone apps. 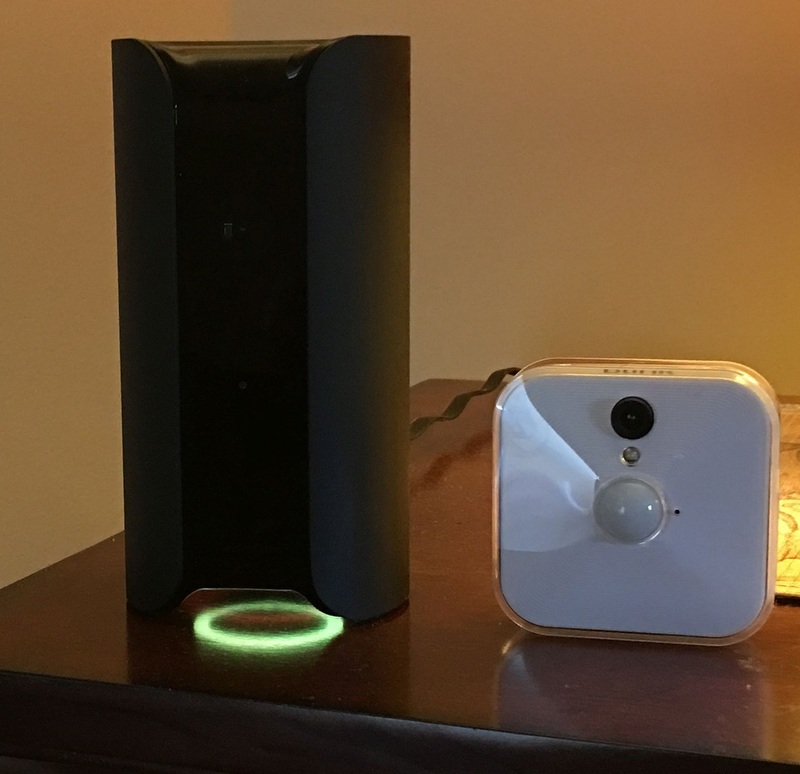 The Canary and Blink both offer motion detection and notifications which is a necessity if calling yourself a home security device. The Canary has some intelligence built in to eliminate redundant alarms for the same motion. The Blink will continue to send alerts although you can minimize the occurrence by applying delays of up to one minute. Blink provides the ability to adjust the sensitivity to the motion detection to help minimize false alerts. The Canary has a learning feature where you can tag the cause of the alert and it will supposedly learn when not to notify you. I say supposedly because I haven’t yet tried out this feature. Neither of these cameras support motion zones to minimize false alerts from areas like trees and bushes which tend to move with the wind. It’s too bad, as I have found this to be the most effective method to eliminate false motion alerts. I’m unaware of plans for either to provide this important capability in the future. The Canary security camera has the ability to determine when the occupants are home and adjust the warnings accordingly. This means that you won’t get motion alerts when the owners of the house are at home. It’s all done via the presence of the smartphones. The Blink security camera does not have this ability but it’s planned for the future. It’s nice to get your home temperature to ensure that the AC or heat are working properly and the Canary security system does this very accurately plus provides humidity and air quality which measures a slew of bad things including carbon monoxide. The Blink Security Camera offers this in their marketing hype but it doesn’t work. It was consistently ten degrees higher than actuality. Emails to the company were returned and they explained they are aware it’s not working but don’t have a fix for it. Connection of both cameras is done through your smartphone and it’s very simple. All done through their respective apps. However keep in mind that the Blink camera connects to an intermediate sync module which connects to your router. Both connect to your router at 2.4GHz using 802.11b/g/n. Blink video from motion alerts are written to the cloud and you’re limited to 7,200 total seconds of storage. It’s then overwritten. Might not sound like a lot but if you’re storing 5 second clips per motion event, that amounts to enough to hold 1,440 events. Canary provides 12 hours of free cloud storage with these camera. You have the ability to download three video clips for the life of the camera. Upgrade to a $49 per year plan to get two days of cloud, unrestricted video downloads and up to 25 bookmarks. Go deluxe at $299 per year and that gives you 30 days of cloud storage. You get a great picture with the Canary. The 1080p HD video is very clear, as it should be. The 147 degree wide angle lens helps to capture close to the entire room if placed in a corner or against a wall. The camera might have the best night vision of any camera I have used. The image is extraordinarily clear even when it’s pitch dark. Blink video comes in at 720p at 30 frames per second. The Blink cameras have a 110 degree wide angle lens. Somewhat less than Canary. The night vision isn’t typical IR but instead uses a very bright LED light. This takes away the ability to be stealth and is actually kind of annoying to people sitting in the room. The Blink Security Camera System is a wireless camera meaning no DC cables. It’s powered with a pair of Lithium batteries that are claimed to last a year. The sync module is what these cameras connect to and this needs to be plugged into a wall. Both cameras offer a microphone to hear sound but no speaker for 2-way communication. The Canary provides the means to sound a siren or call the police right from the app. Blink doesn’t provide that ability. 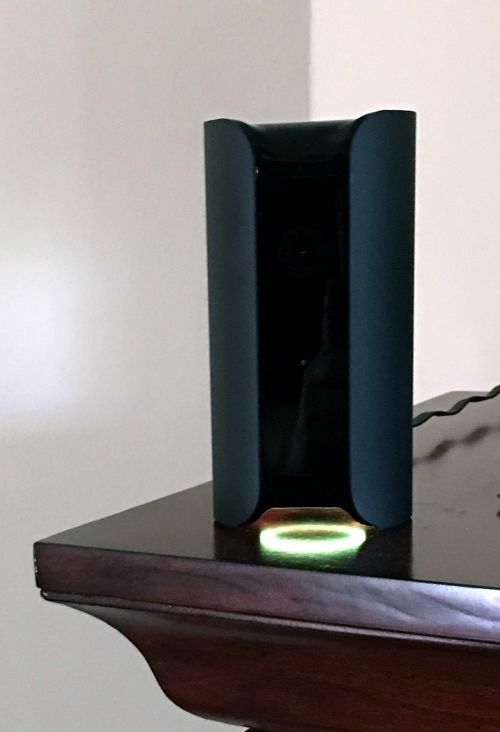 The Canary home security system isn’t made to be mounted. It’s a large device that’s made to stand on a table. The Blink does come with a rear mount so that you can attach this to a wall or ceiling. I haven’t seen anything like that on the Blink Home Security Camera System. The Blink will provide the ability to attach a thumb drive to a USB port on the camera so that you can get on-board storage. However, this isn’t available yet. The Canary All-in-One Home Security System combines a well built high quality camera with security features such as environmental monitoring, motion detection and a siren. 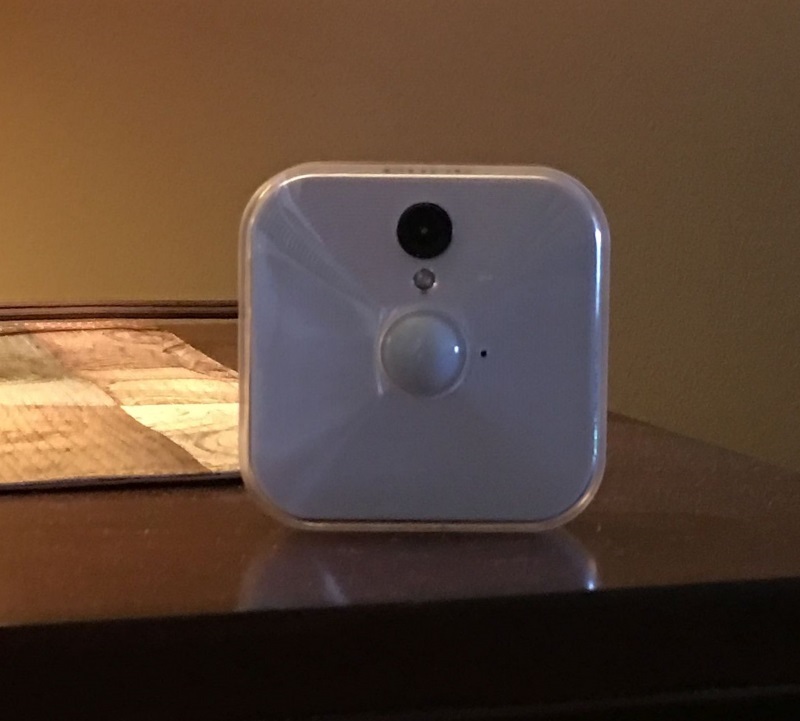 The Blink Home Security Camera System strikes me as a lower end device that isn’t ready for prime time. The lack of functional temperature monitoring and lower quality 720p video makes this an easy choice.